Australians Neill Thacker and Kirsten Smallcombe. 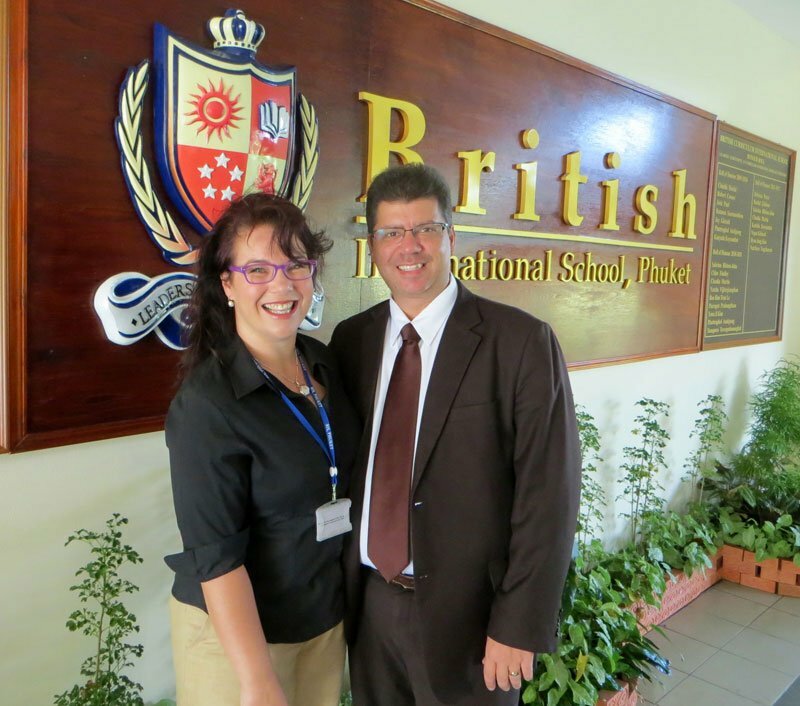 Australians Neill Thacker and Kirsten Smallcombe work together at the British International School. They are the first couple to be featured in ‘The Two of Us’, a new section where we look at prominent Phuket couples who work together, and ask them how they manage to combine work and home lives. 1. Why did you choose a career in education? I have been a full time teacher for 21 years. It is a great job to be in as every day is different. Although you may teach several classes of the same age, the class dynamic is always so different in each and that’s where the excitement comes – variety. So no treadmills in this job. 2. Where did you both meet? We both met in Australia when Kirsten was finishing her honours degree and I was the music teacher of her younger brother and sisters. We met by chance at one of her siblings band performances. I was in my second year of teaching and Kirsten was finishing her university studies. 3. Do you think you both have a similar approach to education? As far as working together in education, we have different roles; me as Head of the Arts and Kirsten as Marketing Manager. In previous schools I have held the same position and Kirsten, the personal assistant to the Headmaster. So in our roles we are both focussed on striving for educational excellence. 4. How do you find living and working together? Working together is great. In our roles we do not see that much of each other at school, but it is so nice to be able to have a coffee or bite to eat together once in a while. It is great as parents too working at the same school that our children attend, as it allows us to go and see some of their presentations when held during the school day. This means a lot to us and our kids. Would we recommend it? Absolutely! I spent most of my career in Australia as a market research consultant working across a range of industries; the education industry however is of great interest to me as the product is personal and complex. As our two daughters attend BIS Phuket, and as the marketing manager, I have a vested interest that the high quality position is maintained in all areas of our provision. We met because Neill at the time was teaching my younger brother and sisters. I had just finished a Bachelor of Business (Hons) at QUT in Australia, so at the time I hadn’t begun full-time work. While at home, my sisters in particular talked constantly about how fantastic and wonderful their music teacher Mr Thacker was, so I was intrigued and wanted to meet him, so I did at one of their concerts. As I am not a teacher, I can’t comment really about my approach to education, I personally leave the education delivery in the hands of the qualified and experienced teachers. Our approach to work however is similar in that Neill and I are both high achievers with a shared work ethic – it always interests me to talk to Neill about his day and to see and feel his passion when he talks about his students’ amazing learning experiences. We hardly ever see each other during the work day because we are so busy and rarely cross paths, but of course we have a great deal in common because we share the same workplace, have the same work colleagues and friends and know of the same students and parents. Working for the same organisation works for us as it is the bustling hub of what we perceive as our community whilst we are based overseas. This is the seventh year that we have both worked at an international school at the same time, Neill teaching and me in administration (two years in Cairo and then three years in Shanghai). Sure, living and working together may work for other couples, but it may not work for everybody especially if working side-by-side day-in day-out.